5/94. Detroit, Michigan. Dave Bing, Chairman, Bing Steel Incorporated and CEO of Superb Manufacturing, Inc, in his office at Superb Manufacturing. 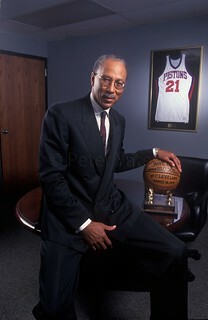 Bing is the former Detroit Pistons star. Photo by Peter Yates.